After decades of doubt and delayed development, the second Sydney airport is on the way. 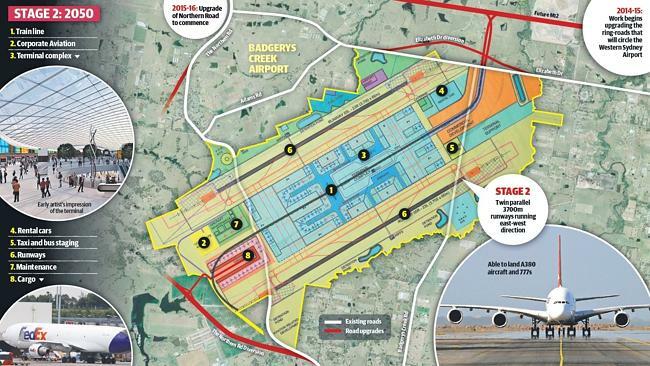 Badgerys Creek is going to be one gigantic, nationally transformative operation that "easily rivals the Snowy Mountains scheme, not only in terms of the sheer volume of excavation works but its significance to the economy." 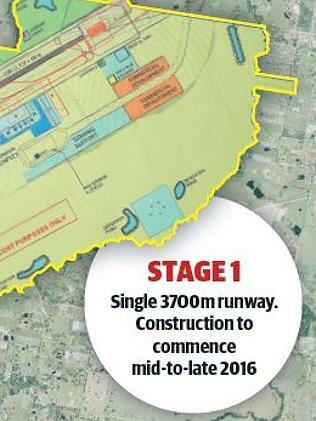 Expected to operate from the mid-2020s, the first stage is slated to be completed within eight years, cost about $4 billion and create a facility capable of handling 10 million passengers a year, including a single east-west runway of 3.7 kilometres, a small terminal servicing international and domestic flights and a cargo terminal. The final configuration should see a world-ranking facility by 2050, with twin parallel 3.7 runways and passenger terminals positioned between them. Once the Airport is complete, the complex could service 80 million passengers a year, double the number currently seen by Sydney Airport. The first detailed plans, drawn up by commercial contractors and provided to the Abbott government in February, show "an initial construction phase involving the excavation of 100 million cubic metres of earth, rock and soil to create a level precinct in Western Sydney of roughly 20 sq km". The plans for the airport's final configuration, obtained by News Corp Australia, reveal a design that could eventually rival the size and capacity of the present JFK International Airport in New York. To put that in perspective, the Daily Telegraph reports the proposed airport is about double the size of the NSW electorate of Newtown, which covers the suburbs of Surry Hills, Redfern, Lewisham, Chippendale, Marrickville, Darlington, Camperdown, Eveleigh, Erskineville, Newtown, Waterloo, Enmore, Stanmore and Petersham. Under the terms in which Sydney Airport was privatised in 2002, the Sydney Airport Corporation must be offered the right to build and operate a second airport in the Sydney basin. The nine-month consultation period between Sydney Airport and the Infrastructure Department ends on June 30. "The next phase will be to develop a proposal that sets out the government's terms including technical specifications, contractual terms and timetable. It will take some months, but it is possible that we would have a formal proposal to present to Sydney Airport as soon as the end of this year. If Sydney Airport refuses this proposal, then we will take it to the open market and offer the opportunity to build and operate the new airport to the other parties" claimed Mr Truss. "A decision by Sydney Airport would be required either four or nine months later, so sometime in 2016" said Sydney Airport chief executive Kerrie Mather. Preliminary work has also begun at Badgerys Creek, including a fresh environmental impact study. Geotechnical analysis is currently underway and in order to profile the subsoil and rock at several locations, more than 100 boreholes of a depth up to 40 metres will be excavated, while earthmoving equipment will dig pits up to five metres deep. If construction commences as promised next year, Badgerys Creek will create a pipeline of thousands of jobs, offering some of the best opportunities that the plant and equipment hire industry has seen in decades. Make the most of it with PlantMiner.